Working as a stay at home mom is no easy task but working online can let you stay at home while earning money too. It can be hard to leave your little ones, and it can be hard going to work to spend most of your check for babysitting. Instead, find an online job that fits your skills, and your schedule. Click here for a massive list of ways to make money right now. The jobs here are all real jobs, and you can find these positions with reputable companies or work as your own boss. With these jobs, you can build new skills and develop a long term career. What Type of Stay At Home Mom Jobs Can You Do? There’s no point in working from home if you’re just as miserable as if you had to head into an office, restaurant, or warehouse every day. A huge benefit of making the transition from stay at home mom to remote working stay at home mom is that you have the time and resources available to find a job that brings you joy. There are nearly endless possibilities of the types of jobs you can find online. But, for your first online job as a stay at home mom, you’ll want to find a position and a company that makes you feel comfortable. Even if you’re ready to step outside of your comfort zone, don’t jump for any position which seems “too good to be true” or take on a position that will require more time than you have to give. Here are just some of the many jobs you can do online, and they’re broken down by experience and education requirements. These jobs are for any stay at home mom that has some spare time and a steady internet connection. 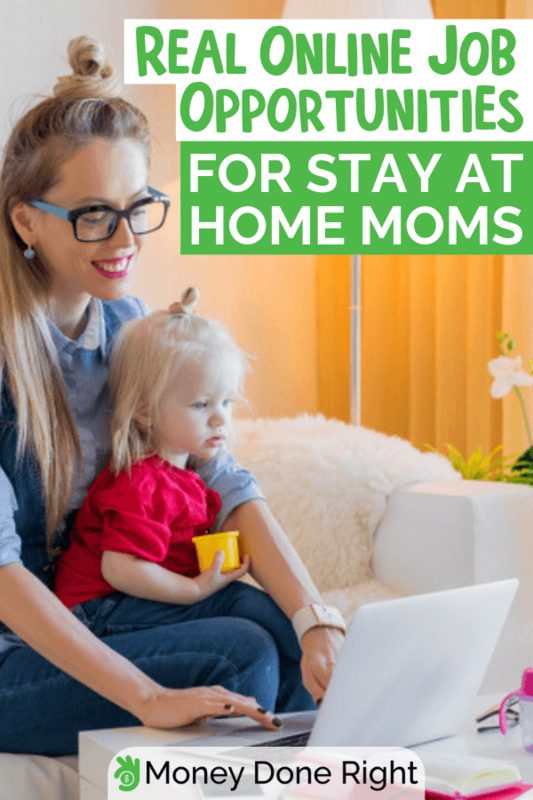 Most stay at home mom jobs don’t require any experience and many companies are happy to provide the chance to build experience working remotely. Customer service jobs are booming for stay at home mom jobs. Customer service is a great job option for stay at home moms with older children. Most customer service jobs require the use of a telephone and have dedicated hours of work. Some companies penalize or let-go of employees that have too much background noise on their calls. Be careful to take these jobs when you can accommodate the employer’s requirements. The positive side of customer service jobs? It’s almost always reputable companies. Hulu, Amazon, and even American Express hire remote workers to handle their customer service calls, an online chat function and answer customer complaints that come in through email. You can find some of these job postings on job boards, but you can also see them on the company’s website. If you’re interested in finding a customer service job online as a stay at home mom, then you should make a list of companies that you would love to work for and find out if they hire remote workers. Bookkeepers are definitely in the highest demand when it comes to small businesses, and they don’t technically need any experience. Typically, a bookkeeper will record transactions, ensure that books balance regularly and keep track of any expenses. Some may assist with payroll or filing taxes. Many stay-at-home moms prefer to work with small businesses because they are generally more understanding of family demands and the desire to make your time at home meaningful. Take advantage of services that help you improve your money management. Sign up with Moneywise today to gain more control over your finances. Many companies are hiring remote data entry workers or outsourcing it to companies who employ online data entry assistants. Either way, there are many jobs with data entry available. Of the many ways to earn money as a stay at home mom, data entry is usually the easiest to get into without working as a freelancer or independent contractor. Stay at home mom jobs should come with the same security as any other job. Real online jobs for stay at home moms are available and data entry jobs are a great way to get work at home experience. There is no limit to the types of jobs you can find online, and many companies are opting to completely dissolve their traditional creative departments to hire independent work-at-home staff instead. Social media marketing and management sit hand in hand, and you can now quickly cultivate a career in social media with nearly any company. You can apply for posted jobs through online job boards, or you can reach out to companies you love on your own. If you’re reaching out to a company that doesn’t have a job posting, offer them unique insights for social media and their industry. You can do a lot of research in a short time for free online when setting up these pitches. Interior design is taking off as an online job because you can video chat with clients and vendors. You can bring together logistical organization with creativity, and many people love this job. Travel agent somewhat falls into the category so let’s cover it first. You can act as an assistant to individuals, small groups of friends, or for families that want a once in a lifetime holiday. Plan everything from setting up shuttles to get them to the airport to ensuring their last night before they arrive home. Virtual Assistants are taking over the online job market, and many high-level executives or busy house managers are letting go of traditional assistants in favor of their digital counterparts. A virtual assistant’s duties will depend on their employer. Typically, you should feel comfortable answering emails, taking messages, making phone calls and placing orders for your employer. If you’re working for an executive, you should be comfortable scheduling flights and making other travel plans or coordinating with event managers for speaking or charity events. Virtual assistants that work with house managers should expect to arrange everything from having dry cleaning delivered to set up recurring pick up and drop off of children, meals and tracking each family members whereabouts whenever they aren’t home. The downside to working as a virtual assistant is that you’re almost always “on-the-clock” meaning that you could easily get calls throughout the day and your to-do list will never end. For many people, they enjoy that they have a determined salary and are taking care of things that most people see as errands all day. Stay at home moms are no stranger to 90% of these tasks, and for many moms, it’s a small addition to what they do already. Human Resources is another example of traditional staff leaving the office and stay at home moms working from their living room instead. Human resources duties include recruiting new talent, hiring, performing remote orientation, ensuring that the company complies with state and federal regulations for all “human” related activities and in some cases termination of employees. If you don’t have any previous skills, you may want to consider Human Resources positions as a top contender for your next job. Real online jobs for stay at home moms can require a bit of experience, education or even a certificate. Of the many ideas for stay at home moms to make money, these job options can make it easy to take advantage of skills or experience you already developed. Okay, to make the really big bucks, you need a bachelor’s degree and certification before you can work as a Certified Practicing Accountant, or CPA. But becoming a CPA starts with working from the bottom up, and that means getting a job in accounting or finance management. With a little bit of bookkeeping experience, or an associate’s degree you can start work as an accounting assistant or finance manager. Many companies are happy to work with, and train, accountants while they continue their education and pursue their CPA exams. Accountants and finance managers have different daily duties. Where an accountant handles more of the mathematics, a finance manager will work with executives or managers to assist with making decisions. If you’re familiar with finding ways to get the most for your dollar spent, then you know about getting cash back wherever you can. Sign up for Ebates for cash back on everyday things you buy online. There are a handful of transcription services available and almost all of them employ remote staff. One of the perfect stay at home mom jobs because transcribing allows you to set your own hours and control your work volume. You do need a certification for legal or medical transcribing but other forms of transcription don’t require anything other than a good typing speed! Virtually anyone can start online tutoring right away, but you want a site or an employer that will prioritize your needs as well as the student. Most reputable online tutoring sites require a bachelor’s degree in any subject, and some require a teaching certification too. If you put your teaching career on hold to start a family, then tutoring could be the perfect way to keep your teaching skills sharp while keeping a schedule that works for you. Tutoring jobs usually cover kindergarten through grade 12 so be ready to come across a wide range of subjects. Fortunately, many of the sites that tutors want to work with such as Qkids and Tutor.com have lesson plans and all the resources you will need ready before you take on any students. To apply for Qkids, click here. You can start tutoring as soon as you go through the application and review process. Tutoring jobs can become demanding, and it’s essential to gauge how many students or how many appointments you’ll be able to handle with the time you have available. Most tutoring jobs are text or voice chat only while you share your screen, but the higher paying jobs usually require video chat as well because it’s easier to communicate with visual aids rather than just text. Sign up now with Tutor.com and submit your application for the chance to tutor full-time. More students now rely on help from tutors online from a wide range of disciplines. Parents are more willing to hire a tutor online to help with basic subjects such as English, Mathematics, History, and Science than they were a few years ago. You can work from home and be your boss all while making time to play with your little ones and enjoy your day too. But it’s hard work, and you have to hustle. Online surveys are something a lot of people try, but not many people are willing to put in the effort. You can earn a full-time income from online surveys, but it’s a hustle. SurveyJunkie lets you start taking surveys now and earning money right away. Almost exclusively freelance you can make a living as a copywriter where you’ll take on subjects including product reviews, tutorials, or writing home pages for local companies. To start a career in freelance writing, you’ll need to have top-notch research and organizational skills. Then start reaching out through third-party freelance sites or on reputable job boards. Outside of copywriting you can find work as an editor or proofreader. These jobs aren’t in as high demand as freelance writers, but there is still plenty of work available. Typically, with any of these positions, you can set your hours although you’ll likely have deadlines. Use tools like Grammarly to improve your writing skills. Sign up for a Grammarly account today! If you’re passionate about writing, you can start your blog about something that genuinely interests you. Click here for a complete guide to starting a blog and learn to make money off your passions! Craft enthusiasts are probably among the most common creative hustles for stay at home moms. You can exercise crafting skills you already have or are beginning to build when playing with your little ones and make some extra money. Sell your crafts on Etsy for a safe and secure way to connect with buyers, then use social media to showcase your products! This old system for wheeling and dealing items online has taken a new spin with the internet. You’re not shopping through swap meets and hoping to make a little more through eBay. Now you can buy cheap electronics on eBay and start selling them for a profit on Decluttr. Join Decluttr now to start selling electronics online and get next day payments! There is no shortage of scams or wastes of time when it comes to finding an online job. It’s likely that you’ll have to wade through some frustrating job postings, but if you don’t start your job search, you’ll never find a job that will let you stay at home, enjoy your time as a mom, and earn an income. Brainstorm a few companies that you would really like to work for and then go directly to their company site. At the bottom of nearly every company’s home page is a jobs or careers section. You can also Google search “ [company name] jobs” and then click on the link that takes you directly to the company’s site. Applying directly with reputable companies lets you know that your application won’t get lost amidst the redirecting process and that you’re applying for a position the company is trying to fill at that time. Direct applications are the best way to avoid scams and ensure your safety. Most of these companies want to see that you have experience working from home, or that you have the skill necessary to work independently. Try applying directly through a company website first. Job boards are the second stop on your job search, and they are great for finding leads, but they are minefields full of scams. Even great job boards that are household names such as ZipRecruiter or Indeed have a ton of scams, and it’s up to you to avoid them. When on any job board, beware of scams. Scams are rampant on job boards, and while many of the companies that host and maintain these boards work diligently to weed them out, they appear like very legitimate job postings. Always Google search the company before you apply. Check Glassdoor, the BBB, or the FTC for claims that the company is a scam. Never give away your banking information before hiring. Don’t give out personal information on anything other than an official tax document. These five steps can help you avoid most, if not all, the scams posted on work from home job sites. Scammers look for ways to obtain money, your personal information like your social security number, or your banking information. Providing personal information and banking information is part of most onboarding experiences when starting a new job, which is why it’s imperative that you exercise caution. A legitimate company will never try to have you complete a W2 via phone, and they will never have you authorize direct deposit over the phone, skype or any other communication medium. Wait until you see that you’re fully employed, that the company is legitimate and that any information requests are on legal or government documents before giving that information away. Any company that requests money for these items is likely a scam. Companies that require background checks will often pay for it or take the funds from your first paycheck. No company should charge applicants for legal document fees or training, and finally, no company should ever pay for a typing test. Be very firm on not paying anything before you find a job. The one exception that is reasonable to make a payment for is FlexJobs. The company acts as a service monitoring the Internet for any work from home job and then tries to match them with you. For this service, you pay a monthly fee and can cancel anytime. Flexjobs has the lowest volume of scams and provides detailed reports and guidance on finding legitimate online jobs. Click here to sign up for Flexjobs now! Freelance marketplaces are forums for people trying to hustle or find new clients. Some websites facilitate everything including payment and can guarantee in some situations that you get paid for work that you complete. In other cases, these marketplaces act as a bridge for communication, and there’s no guarantee of payment. Outside of the creative fields, you can expect people to turn to freelance marketplaces when they’re looking for more than one client. For example, if you’re a bookkeeper or virtual assistant and have time to handle more work than the one client you’re already working with, you can usually find a part-time job in a freelance marketplace. Make your search as specific as possible when looking for jobs in these marketplaces. The more likely you are to find a client that fits your needs. Don’t be afraid of missing job opportunities, be picky! When you’re applying in person, you have the advantage of matching your resume with a face, and that’s not something you can do when applying online. This information can make it impossible for an employer to consider your resume because it puts them at risk of accusations of discrimination. Beyond what you look like, you don’t have that 30-second window to show-off your personality either. So, what can you do? You can make the best darn resume you’ve ever put together. A resume can show personality, and it should explain what you plan to bring to the table as an employee. When designing your resume, you should divide visual design and content. Think about the two aspects of your resume separately. You have one chance to wow your future employer, and you want something that looks different than what anyone else submitted for the job. So, step away from the Microsoft resume templates, and avoid LinkedIn’s resume builder too. Those templates get tons of use and recruiters see them thousands of times a week. Instead, start with a piece of scratch paper and divide it into a few different sections and start arranging them in a way you think will read easily and bring focus to your best traits. If you have more education than experience, put education on the page where your eyes glance to first. Only include these additional segments if they’re relevant to the position. For example, if you’re applying for work as a tutor and don’t have job experience working as a teacher or tutor you can include volunteer work you’ve done in classrooms or that your objective is to acquire a teaching certification. Design a different resume for every position and use each segment to target the needs of that employer. You’re using your resume to market yourself, and that means using words that will provoke that recruiter to hire you. Use language that shows action, whether it’s you performing an action or taking action in the future. Use words that end with “s” or “ing” to show that these are skills you “do” not just skills you have. Starting work as a stay at home mom comes with a lot of hesitation because many moms don’t believe their skills will translate into job positions. But even if you don’t have any prior work experience you have a vast array of skills that you exercise every day and will make you a valuable employee. Keep this in mind as you design your resume because its vital that you create your resume with confidence in yourself. The great thing about applying for online jobs is that you almost always have a point of contact. An email address or phone number means you can follow up on your application. When you’re applying to online jobs, be sure to extend the same courtesy that you would if you were handing in a paper application. You should give the person reviewing your resume or application at least a week without contact before following up because your application is going through multiple stages of review. After waiting a week, send a short email, or call them directly offering to provide more information if necessary and end with good wishes or thank you, so the email or phone call ends on a positive note. If a potential employer tells you, they filled the position, be sure to remain as respectful as possible as they may have more opportunities in the future! Like any other job search, you will likely apply to many places before you, and your future employer can find each other. If you don’t find something right away, keep looking for a company and a position that is a mutually beneficial match.